One of the wonderful things about visiting a region in the Southern Hemisphere is that while it may be cold in North America, the South is in its best season where it's warm and festivals are aplenty. If you are planning a trip South check out these great festivals in February and March. Carnaval Without a doubt one of the world's biggest celebrations is Carnaval and while it is often associated with Brazil, and more specifically Rio de Janeiro, what most people do not know is that it is actually held throughout many cities in South America. For example in Southern Peru it is common for kids to throw color-infused flour at each other and even adults are not immune to the foam fights. In Salta, Argentina there is a large parade with water flights. 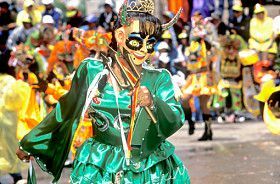 In Bolivia the citizens combine Catholic and indigenous traditions into a series of dancing and costumes so elabtorate that UNESCO recognized Oruro as a World Heritage site. And of course Brazil hosts the most famous 4-day party with elaborate costumes, music and a giant parade. Held on February 2nd, this festival is celebrated in Bolivia, Chile, Peru, Uruguay and Venezuela and remains of the largest festivals in South America, competing with Carnaval's largest parties in Rio de Janeiro and Oruro. This festival honours the Virgin of Candelaria, the patron saint of Puno, Peru and celebrates the traditions of the indigenous people of Peru, namely the Quechua, Aymara and the mestizos. For this reason Puno is the biggest and brightest of all of the celebrations. The number of people participating in the festival is astounding with the heart being the dance and music performances by Regional Federation of Folklore and Culture of Puno. Here more than 200 traditional dances are performed by the local indigenous communities. That number may not appear to be immediately significant but it means over 40,000 dancers and 5,000 musicians and does not factor in the tens of thousands of people who arrive to share in the festivities. While the Virgin of the Candelaria is the patron saint of Puno, the actual home is in Copacabana, Bolivia. However, the activity here may be considered subdued as it is primarily in the streets with a parade and musics. While it may be a less extravagant affair it is still a memorable event. The Festival of Song is held in Viña del Mar, Chile in late February. A large music festival, it highlights the best of Latin America and abroad in the city's outdoor ampitheatre. Mendoza is the shining star of Argentina's wine community which is celebrated early March. It is an entertaining festival filled with great wine and food, that celebrates the culture of the area featuring gaucho traditions. And of course no Argentine festival would be complete without fireworks and a beauty contest. Held in Suriname, this is also known as Phagwa in Bhojpuri, and more commonly known in English as the Festival of Colours. Although South America is known for its many Catholic or indigenous events, this is a very important Hindu festival held each Spring. But regardless of religious background, you will see a familar sense of celebration with kids throwing coloured flour or water at each other. But here the colored powder has a medicinal benefit as they are made from Neem, Kumkum, Haldi, Bilva, and other medicinal herbs often prescribed by Ayurvedic doctors. But the most important thing you need to know is that it doesn't matter when you go to South America, there is plenty if culture, music and colourful traditions to keep you busy all year long.